There are times in your life when you need a real statement necklace. This is it. Big, bold and utterly divine with a little black dress, or gracing your neck when you're wearing a tux or jacket with a cami-top or vest, Belgravia is pure dress-to-kill. 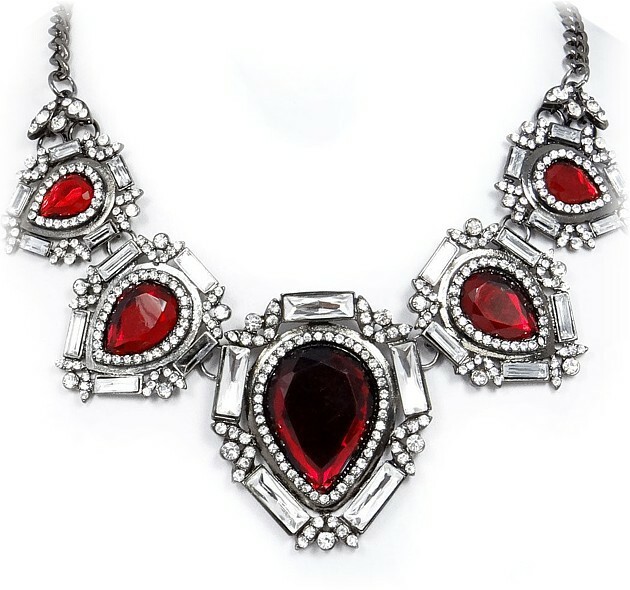 Given its stature, as the photo shows, it's also more-than-capable of jazzing up a Victorian blouse, a crisp white blouse or jumper, Belgravia features a red garnet Swarovski crystal teardrops and crystal clear rectangles, intermixed with crystal clear rhinestone circles, all set in a vintage silver setting. Size: 44 - 51cm (17¼" - 21").